Please enter the code ARTNRC5SN when booking. Please enter the code ARTCBT5SN when booking. To qualify for your £25 Advanced Training discount please phone the office or pop in to see us. Want a 7.5% discount on your motorcycle or scooter insurance? 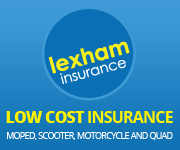 Want an introductory discount on your motorcycle or scooter insurance? Simple, just train with us and we will give you a discount code for Lexham, this offer applies to all of our on road training courses. Please note 60 & 90 minute lessons and CBT discount shown on this page are only available through our online booking service.